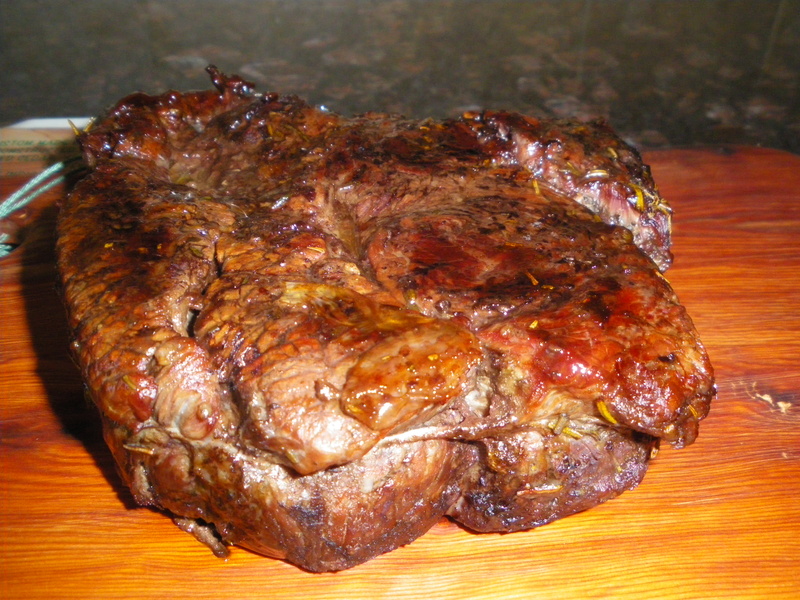 The meat can’t be too lean, otherwise the roast will be dry, you can select a pot roast type meat such as blade or even a top sirloin. Both cuts are inexpensive and the “slow-roasted beef” is a good option when you have a bunch of famished teen-agers and/or athletes coming back from racing on a Sunday night. This is not a last minute improv, however. The night before, I insert 2 cloves of garlic -cut lengthwise into quarters and core removed- into the meat either under the fat or right in. Then, I put the whole roast in a ziplock bag with one cup of wine- just about any kind will do even leftovers thyme, one bay leaf, a little bit of rosemary, a splash of Worcestershire sauce, and one half tsp sugar, one tbsp oil and a pinch of Montréal steak spices. Close the bag, shake well and keep in the fridge turning over a couple time. The next day, I take the meat out at least one hour before cooking, I set it up in a greased roasting pan and start roasting preferably in a convection oven on medium/low heat for one hour. At this point, I bring it out, put the roast on a plate and throw out all the grease in the pan, not scraping or rinsing, just getting rid of the extra fat. Then the meat goes back in the pan, stays on the counter for 20 minutes to rest. At that time the oven is on low, and I give it another 40 minutes to more than one hour depending on the size of the roast. The meat goes to rest on a cutting board again covered with foil to keep it warm while I add a cup of hot water or the wine from the marinade to the pan for the “jus”. Stir well, add a “noix de beurre”, salt, pepper. Cream is an option, or finely chopped mushrooms (such as chanterelles or morilles) or both. Warm up again. 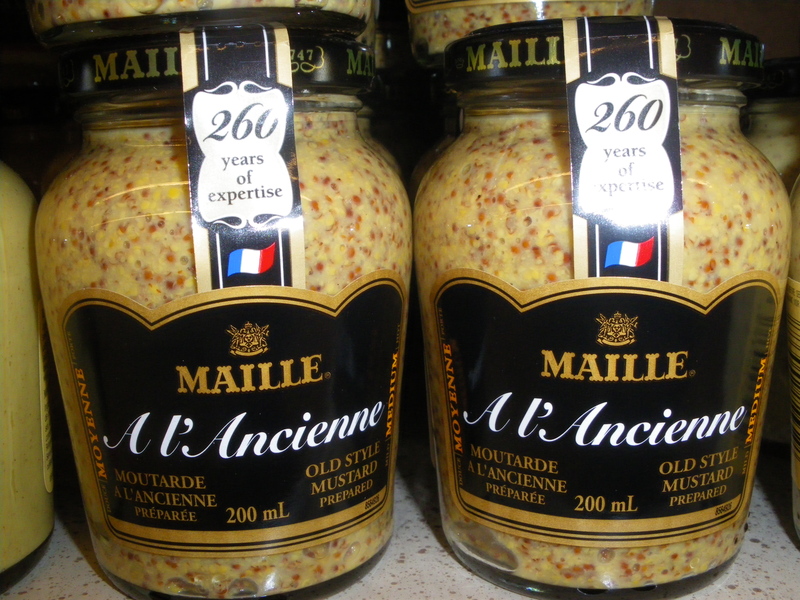 Slice the meat, serve with Dijon Mustard, or Moutarde à l’ancienne. 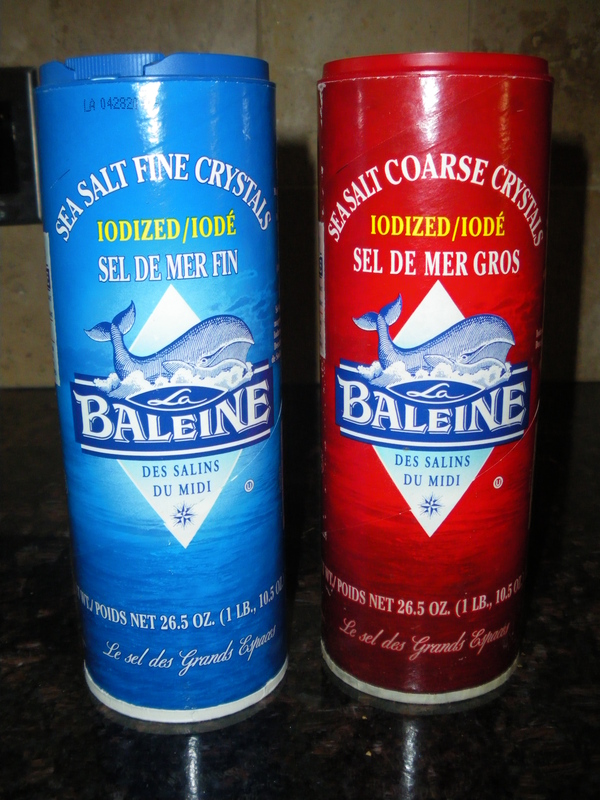 La Baleine’s coarse sea-salt crystals are much nicer than the fine stuff. Note:BBQ experts can try this on the grill, the key is to prevent the outside to turn into charcoal, using foil blankets and low gas. It is well worth it if you have the patience and a dedicated crew out there. This entry was posted in Main Course and tagged food, recipes. Bookmark the permalink.